Fine. B002RI98BA ALL BOOKS SHIPPED WITHIN 1 DAY OF PURCHASE! Good. B002RI98BA ALL BOOKS SHIPPED WITHIN 1 DAY OF PURCHASE! Very Good. 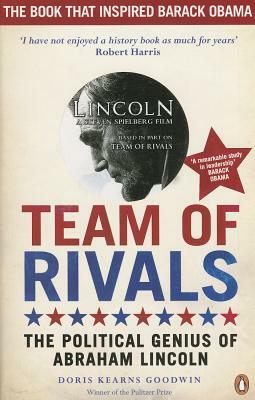 Team of Rivals: The Political Genius of Abraham Lincoln by Goodwin, Doris Kearns. Sewn binding. Cloth over boards. With dust jacket. 916 p. Contains: Unspecified. Intended for a young adult/teenage audience. A tad bit long, but overall, an interesting read. The story of all the personalities and the interplay between the individuals, sometimes made me want to keep a scorecard. The research that Doris Kearns Goodwin did is incredible...She brings Abraham Lincoln to life...If you enjoy reading about the Civil war era then this is a must read. inside head of lincoln, we learn for our own personal dealings. This book is one the offers many insights into Lincoln the man. The author's research into all the personalities the Lincoln surrounded himself with makes for a fascinating read. I highly recommend this book to anyone who is curious about Lincoln will enjoy this book.